Front of the recipe card for Steak Diane. 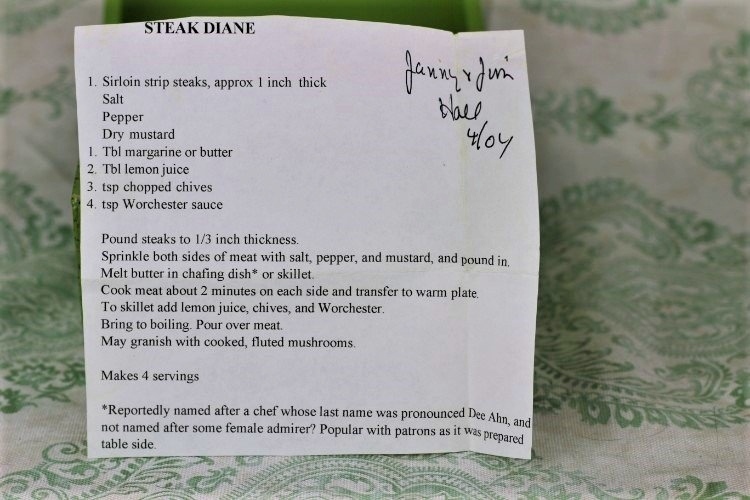 There are lots of fun recipes to read in the box this recipe for Steak Diane was with. Use the links below to view other recipes similar to this Steak Diane recipe. If you make this Steak Diane recipe, please share your photos and comments below! Pound steaks to ⅓ inch thickness. Sprinkle both sides of meat with salt, pepper, and mustard, and pound in. Melt butter in chafing dish* or skillet. Cook meat about 2 minutes on each side and transfer to warm plate. To skillet add lemon juice, chives, and Worchester. May garnish with cooked, fluted mushrooms. *Reportedly named after a chef whose last name was pronounced Dee Ahn, and not named after some female admirer? Popular with patrons as it was prepared table side.